Casa Batlló is one of the most interesting buildings in Barcelona. Here you can discover Antoni Gaudí's style in every detail. Many elements at and in Casa Batlló refer to the legend of Saint George - in Catalan Sant Jordi. As the patron saint of Catalonia and symbol of modernism, he can be found in numerous works by Gaudí. Here you can book tickets for the admission to Casa Batllo without standing in line. Admission without standing in line incl. audio guide, daily until 21:00. Our vouchers are valid for a single admission throughout the entire calendar year. So you do not have to commit to a specific date beforehand. It's easy to book: please enter the number of persons you would like to book for at the upper right and click on "Add to Cart". You will receive a voucher for the admission immediately after booking. Simply print it out and show it to the respective person. You will receive directions along with the voucher. A cancellation is possible up to 6 weeks after booking (latest possible date for cancellation is 15 January of the following year), provided that the voucher has not been redeemed yet for the admission. There are many stories and legends about Saint George and Sant Jordi, as it is called in Catalan. The best known story is about a terrible dragon, which scares a small village. In order to please the monster, the villagers must regularly offer him a human sacrifice, which is determined by lot. One day the lot falls on the king's daughter. The daughter is therefore led to the gates of the city and is waiting to be devoured by the dragon. Right that moment Sant Jordi appears, faces the dragon and defeats him. With his lance in the form of a cross, he gives the dragon the fatal blow and thus saves the princess. Exactly at the spot where the soil is supposedly soaked by the blood of the dragon, red roses grow. Incidentally, this is also the origin of a tradition according to which the women in Catalonia receive roses each time on the day of Saint George - the 23rd of April. Sant Jordi is patron saint of Catalonia. Which is why dragons have always played an important role in Gaudí's works. 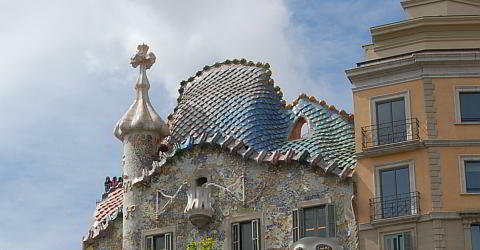 The roof of the Casa Battló is shaped like the back of the frightening dragon with large, shiny scales. It consists of tiles on double attics, which are adapted to the organic architecture. On the left, the roof is bounded by a tower with a four-armed cross. With a little imagination you can spot the lance of Sant Jordi in the back of the monster. Behind it there are sculpted ventilation ducts and chimneys that look like the guards of the house. In the window openings you can see columns that are modeled similar to the shape of bones. The roof area, at the top of the building, has always had a special significance to Gaudí. The roofscape of Casa Batlló offers a great view over the city and is decorated with countless small details. For example, if you look from the terrace through the hole in the left part of the curved roof, you have a direct visual axis to Sagrada Familia. Gaudí has already worked on his masterpiece at the time of the renovation work. The return to natural elements and forms is very typical for the Modernisme, the Catalan Art Nouveau. The gently curving balconies of Casa Batlló are reminiscent of the waves of the sea, and the entire facade is littered with flowers. Barcelona's most famous modernistic architect, Antoni Gaudí, created Casa Batlló. Today it is on the UNESCO List of World Heritage. Casa Batlló is a reconstruction of an existing building. It was completely redesigned from 1904-1906 on behalf of the industrialist Josep Batlló. Especially in the lower part, the Belle Etage, Gaudí's handwriting is clear. Formed like bones on the outside, reminiscent of a forest from the inside, the columns of the facade make an important contribution to the shape of the building. As it is typical for him, Gaudí drew inspiration of nature. Inside, curved and organic shapes dominate the walls, ceilings and furniture. The shapes on the first floor of the residential building are reminiscent of plants and caves, the balcony railings of skull bones. The fireplaces on the roof do not serve as chimneys, but are part of a sophisticated ventilation system that keeps the house nice and cool even in the summer, without the need for air conditioning. Casa Batlló is located on one of the main axis of the Modernisme. Starting around 1850 the demolition of the city walls of Ciutat Vella began and a new modern district, the Eixample, was born. The Passeig de Gràcia, which divides the district into two halves, became the boulevard and the scene of the most magnificent architecture of the period. The block around Casa Batlló is also called the "Illa de la Discòrdia", or "island of discord" in English. At this point, the most important architects of Modernism tried to outdo each other. The result was a variety of buildings that now form an ensemble on this front of the house. Directly to the left of Casa Batlló you can see Casa Amatller, also a splendid example of Modernism. The building was designed by the Catalan architect Josep Puig i Cadafalch. The clear, neo-gothic inspired facade stands in clear contrast to Casa Batlló. A little further down the road, at the corner of the apartment block, you can see Casa Lleó. This house was designed by the founder of modernism Lluís Domènech i Montaner. It shows the mixture of different styles, both on the inside and outside. Hardly any other building is as organic and playful as Casa Battló. This makes the house unique and rightly it was included to the list of World Heritage by UNESCO in 2005. Visiting the interior of Casa Battló is especially recommended. Immerse yourself in Gaudí's world and discover the many small details of the building from the ground floor to the impressive roof terrace. Casa Batlló is the last house that Gaudí built, before he dedicated himself to the construction of Sagrada Familia. Here he created yet another highlight of his work: the house is beautiful and exciting at the same time. There is a lot to discover, many stories are revealed only after repeated inspection. It is rightly considered one of the most beautiful sights right in the heart of Barcelona. With our admission tickets, you can save a lot of time, because you can easily go in there, even without having to set a specific time or date in advance. With the Barcelona Card you get discount at the box office. Please enter the desired number of tickets.